A Gran Fondo is a cycling event which is generally open to all participants on payment of a fee and usually over a distance of between 40 and 150 miles. Most gran fondos will have at least three distances, which allows participants to gradually build up to the 'elite' distances. The name 'gran fondo' comes from Italy where it refers to a particular type of cycling race where roads are closed and the event is timed; Italian gran fondos are a popular route for junior Italian riders looking to turn pro and they are serious and competitive races. The term grand fondo has become a popular term for amateur cycling events in the United States and Australia and is also used by some event organisers in the UK and South Afria. These gran fondos are sometimes run on closed roads but often are on open roads (ie cars and other motorized vehicles may be on the roads) and while they may be timed most of the riders are not racing against the clock. In other countries they tend to still use the term 'cyclosportive' or 'sportive' (which is probably the most used version in the UK) for the same type of event. 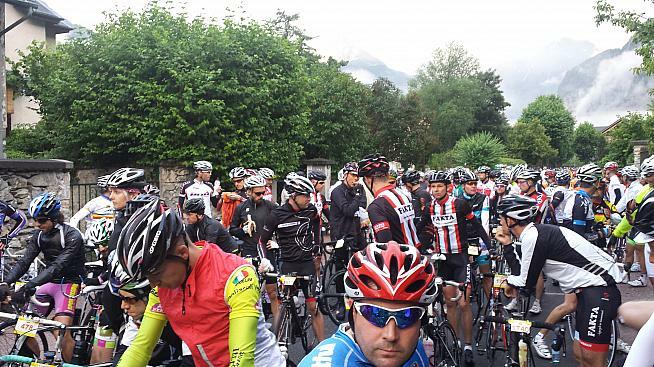 The popularity of gran fondos has grown enormously in the past decade. Some have compared grand fondos to being a cycling equivalent of marathon running and it is definitely true that there are some similarities, in that everyone from pro-level athletes to complete amateurs can take part in them and the slowest person can take as much as three times to complete the course as the fastest person. Generally speaking, gran fondos will have different timing targets for competitors and these gold, silver and bronze times will be published in advance so riders looking to hit a particular time will know what they are aiming for. The timings are usually divided by age, usually in line with the country's standard racing ages for competitors (which usually means 18-30, 31-39, 40-49, 50-59 and 60+). The entry fee for gran fondos - which can range from as little as $50 to as much as $400 depending on what the event is - usually includes a timing chip (which you either fit to your bike or helmet), food at several stops along the route, mechanical support before and during the event and either a medal or certificate for finishers. Additional facilities that some organizers will offer include video or photos (or both) of competitors, a meal either before or after the event, prize money for the top finishers, a commemorative T-shirt or other clothing and a goody bag of things such as nutrition bars, gels, bidons and a collection of brochures for other gran fondo events! Very often organizers of gran fondos - especially in the United States - will try and create a weekend festival of cycling around their gran fondo so participants can bring their family and children and everyone can participate in some way. Check out our listings of Gran Fondo events to see one suitable for you.